AstroCryptoTriviology: A Jones for MOL #4: He for two, and two for He. A Jones for MOL #4: He for two, and two for He. This was supposed to be an easy blog entry to write. A few months ago, I was wondering whether the two pilots really would have sounded like chipmunks in the MOL’s atmosphere of 70% oxygen and 30% helium at 5 pounds per square inch (psi) (see * endnote below). I Googled for some basic information on inspired gas composition and voice quality, and thought I had enough for a short essay. But a few questions presented themselves, and I didn't know the answers: why was a diluent gas added to what started out as a 100% oxygen spacecraft environment? Why was helium (the “He” in the title) chosen? And why was 5 psi even in the discussion? Last question first: MOL was initially planned to use pure oxygen at 5 psi because Gemini was designed to use it—and eventually did use it without problems in ten manned flights in 1965-1966; Gemini used it because Mercury had used it without problems in six flights in 1961-1963. The Mercury spacecraft was designed by NASA in 1958 and built by McDonnell Aircraft Company in 1959 using pure oxygen at 5 psi because the required life support system was relatively lightweight. Gemini had started out as a two-man “Mercury Mark 2” to be built by McDonnell, so many design decisions were just rolled over from Mercury to Gemini to minimize the costs. Ground studies had shown no pulmonary problems in up to 30 days of 5 psi of pure oxygen (ref. 11). Thus, there was previous flight and ground experience in terms both of health and of knowledge of structure and systems design behind the selection of this low pressure. But why was 5 psi even chosen for Mercury? If the goal was to maintain oxygen partial pressure (designated “pPO2“ in the short-hand of physiologists that I learned in grad school) in the lungs at sea-level values, why not use the value adopted by Mother Nature? Oxygen makes up 21% of our 14.7-psi atmosphere for a pPO2 of 3.1 psi. 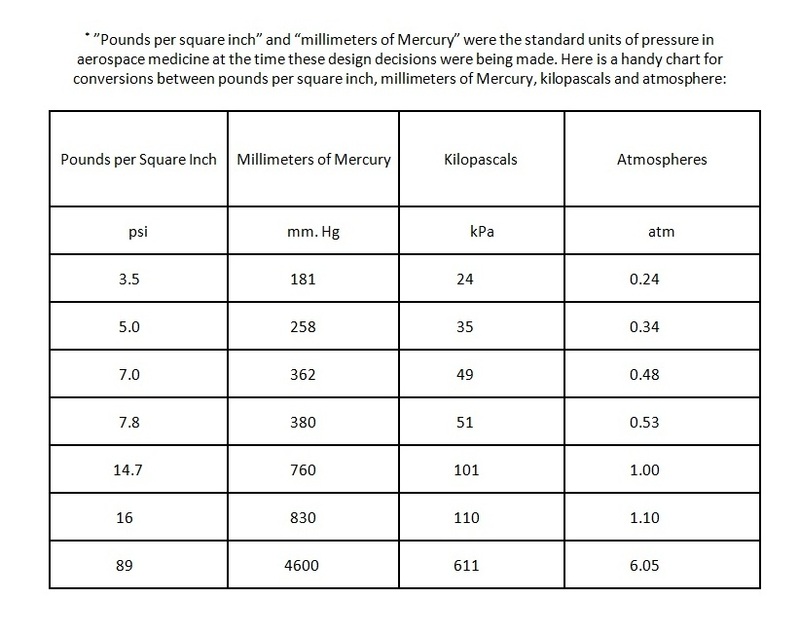 Why did Mercury adopt a cabin pressure 1.9 psi (61%) higher than found at sea level? Part of the answer seems to come in a NASA report written by John Kimzey at NASA’s Manned Spacecraft Center in early 1966 (ref. 9). First, pPO2 had to be greater than 2.8 psi to prevent hypoxia (too little oxygen for respiration) but less than 7.3 psi to prevent oxygen toxicity. Oxygen toxicity included such problems as pulmonary atelectasis (a type of lung collapse), decreased hematopoiesis (production of red blood cells), visual effects, seizures, nausea, tinnitus (ringing in the ears), dizziness, lightheadedness, retching, parasthesias (uncomfortable skin sensations) and poor concentration (ref. 10). Second, the total pressure must be such that during a rapid decompression from cabin pressure to emergency spacesuit pressure, a maximum pressure-change ratio should be less than 2 to 1. Since 1960s-era space suits restricted their wearers’ mobility unacceptably when they were pressurized to more than 3.5 psi (ref. 8) above the external environment—namely, a vacuum, in the case of a major spacecraft leak in orbit—a cabin pressure of no more than 7 psi was required. Kimzey didn't say why that led to a pressure of 5 psi rather than, for example, 6 psi but I think it may have been because it was uncomfortably close to the oxygen toxicity value of 7.3 psi, allowing only 5% possibility for error in the sensors and gas supply system. A cabin pressure of 5 psi almost exactly split the difference between the upper limit of 7.3 psi and the lower limit of 2.8 psi necessary for life. This argument also worked in connection with planned—not accidental—decompressions, to permit extravehicular activity (EVA), or space walks. In addition to health concerns, there were considerations of fire safety of materials used inside the cabin which apparently motivated the Air Force to evaluate use of mixed gases a instead of pure oxygen (ref. 8). Man-rating a pure oxygen atmosphere even at 5 psi would drastically limit material choices when considering toxic contamination and flammability (ref. 9). As noted by an Aerospace Corporation report (ref. 3), MOL’s mixed gas atmosphere would also have reduced the risk of an in-flight fire. This was a fortuitous benefit in the post-Apollo fire time frame The loss of three NASA astronauts in 1967 in a pre-launch ground test of an Apollo capsule (ref. 1) pressurized with 100% oxygen to 16 psi had literally re-ignited the debate over NASA’s choice of a 5 psi pure oxygen environment for its Mercury, Gemini and Apollo series vehicles. Draconian steps were taken to fireproof the Apollo command module to allow NASA to retain the relatively simple and lightweight hardware of the 100% oxygen environment. Gemini-B had already demonstrated its compatibility with pure oxygen and thus could accommodate the MOL’s less fire-supportive oxygen-helium mixture, but MOL was not planned to be fire-proofed for a 100% oxygen environment. By November 1964, the Air Force was debating the relative merits of a one-gas system, 100% oxygen at 5 psi, and a two gas system, 40% oxygen and 60% nitrogen at 7 psi (ref. 4). That same month, it also conducted its first manned tests of a third variant: half an atmosphere (7.8 psi) at 50% oxygen and 50% helium (ref. 2). Another study compared the decompression sickness risks of mixed oxygen-nitrogen and oxygen-helium atmospheres at 7 and 5 psi, with oxygen maintained at 3.5 psi (ref. 11). In early January 1965, the Air Force had not yet decided whether to fly MOL with an environment of pure oxygen or mixed gas (ref. 5). But during 1965, a major study of the physiological and psychological effects of 56 days in a chamber built to simulate the MOL on four aircrewmen tested only the 5 psi 70% oxygen 30% helium atmosphere—not pure oxygen and not oxygen-nitrogen (ref. 8). Thus, it appears that the decision on the oxygen-helium cabin atmosphere for MOL had been made by that time. But why helium as the diluent gas? Helium had never been used in a spacecraft cabin before MOL adopted it, and it has never been used since MOL. The Soviet Union evaluated a helium-rich atmosphere for future space vehicles (ref. 2) but every Soviet and Russian spacecraft type from Vostok to Mir successfully used a cabin environment very close to Earth’s atmosphere at sea level, as did the U.S. Space Shuttle. Both the Russian and U.S. segments of the International Space Station (ISS) are baselined for a sea-level atmosphere. While Mercury, Gemini and Apollo used pure oxygen at 5 psi, after 1967 Apollo was pressurized with 60% oxygen, 40% nitrogen on the launch pad to minimize the chance of another fire (ref. 10). Skylab later used an atmosphere of 70% oxygen and 30% nitrogen at 5 psi to provide the same benefit (ref. 6). Helium was selected apparently because it was relatively inert chemically, was insoluble in blood or retained in the blood like oxygen to prevent bubbles when environmental pressure is reduced, and suppressed combustion, and in spite of the facts that helium was not trouble free from the standpoint of vocal communication and did not have a small diffusive leak rate through seals and gaskets (thus satisfying only three of the five criteria established by Kimzey for inert gases as atmospheric diluents in spacecraft) (ref. 9). However, a study of 50-50 gas mixtures found no greater protective effect of oxygen-helium than for oxygen-nitrogen during decompressions from likely cabin atmospheres (ref. 7). Somewhere out there is a study that supports 70% oxygen-30% helium at 5 psi, but I have not seen it. EVA was an early requirement for the MOL research program, to evaluate the pilots’ capabilities for military tasks outside the spacecraft (ref. 12). EVA was also an early option for transfer between the Gemini-B and the MOL pressurized module, before the decision was made to implement the heat shield hatch. It is not clear that the program maintained major EVA requirements after 1965, when MOL was refocused from a testbed for military astronaut capabilities to a reconnaissance test platform. But the weightless transfer tests on the KC-135 in 1966 described here included parabolas with the pilots wearing what appear to have been Gemini G4C EVA suits made by The David Clark Co. The new MOL-specific space suits ordered from Hamilton-Standard in 1967 and delivered in 1968—just a year before the program was cancelled—also had EVA capability (ref. 12). Therefore, EVA requirements influenced MOL planning and design throughout the program’s lifetime. As an aside, if EVA were not even a contingency requirement, it might have made more sense to outfit the MOL pilots with the light-weight G5C space suits worn on Gemini 7, which I blogged about previously. They could have been doffed and donned even in the confines of the Gemini-B cabin, and would have made it much easier to pass through MOL’s narrow hatchways and long tunnel while still providing the necessary backup to the cabin pressurization system during launch and early orbital flight. Anyway, for a variety of reasons, after mid-to-late 1964, helium was in consideration as the diluent gas for the MOL pressurized laboratory, and after mid-1965, it appears that the decision had been made to use helium. My wife told me not to make these articles so long—after all, they’re just blogs—so I will leave the discussion of voice quality in MOL’s oxygen-helium atmosphere to the next one. 1. __, Apollo 1, http://en.wikipedia.org/wiki/Apollo_1 (accessed 1 Oct. 2012). 2. __, “Helium Test,” Aviation Week & Space Technology, Nov. 23, 1964, p. 25. 3. 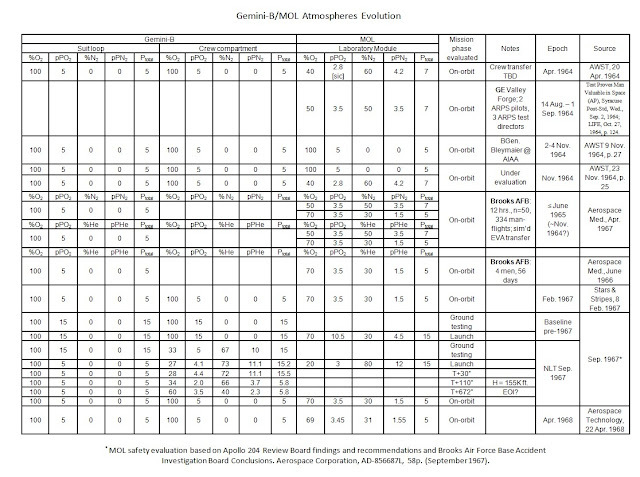 __, “MOL Safety Evaluation Based on Apollo 204 Review Board Findings and Recommendations and Brooks Air Force Base Accident Investigation Board Conclusions”, September 1967, prepared by MOL Systems Engineering Office, Aerospace Corporation, for Deputy Director, Manned Orbiting Laboratory Program, MOL System Program Office, OSAF Headquarters, Space Systems Division, Los Angeles, California 90045. 4. __, “Six Astronauts Picked for MOL; Assignment to Specialties Planned,” Aviation Week & Space Technology, Nov. 23, 1964, p. 25. 5. __, Weekly Activities Report (For Week Ending 15 January 1965), Assistant for Manned Space Flight, MOL Program, courtesy of Dr. Dwayne Day. 6. Bacal, K., G. Beck and M.R. Barratt, “Chapter 22: Hypoxia, Hypercapnia, and Atmospheric Control,” in Barratt, M.R., and S.L. Pool (eds), Principles of Clinical Medicine for Space Flight (New York: Springer, 2008). 7. Beard, S.E., T.H. Allen, R.G. McIver and R.W. Bancroft, “Comparison of Helium and Nitrogen in the Production of Bends in Simulated Orbital Flights,” Aerospace Medicine 38(4): 331-337, April 1967. 8. Hargreaves, J.J., W.G. Robertson, F. Ulvedal, H.J. Zeft and B.E. Welch, “Study of Man During a 56-day Exposure to an Oxygen-Helium Atmosphere at 258 mm. Hg Total Pressure I. Introduction and General Experimental Design,” Aerospace Medicine, 37(6): 552-555, June 1966. 9. 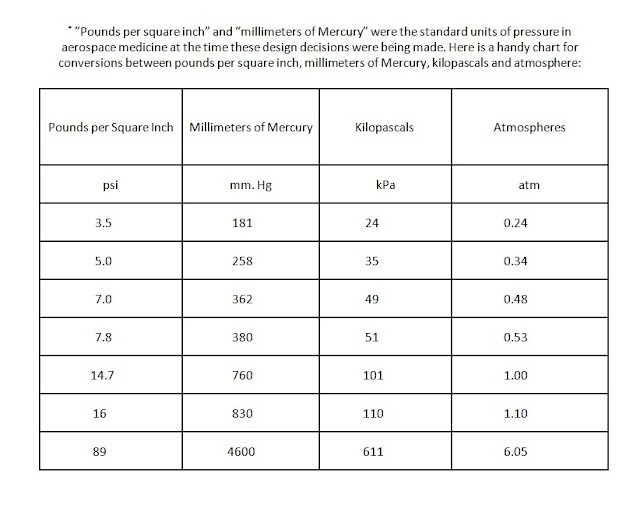 Kimzey, J.H., Flammable and Toxic Materials in the Oxygen Atmosphere of Manned Spacecraft, NASA TN D-3415, NASA, May 1968, http://ntrs.nasa.gov/archive/nasa/casi.ntrs.nasa.gov/19680015284_1968015284.pdf (accessed 30 Sep 2012). 10. Michel, E.L., J.M. Waligora, D.J. Horrigan and W.H. Shumate, “Chapter 5, Environmental Factors,” in Johnston, R.S., L.F. Dietlein and C.A. Berry (eds. 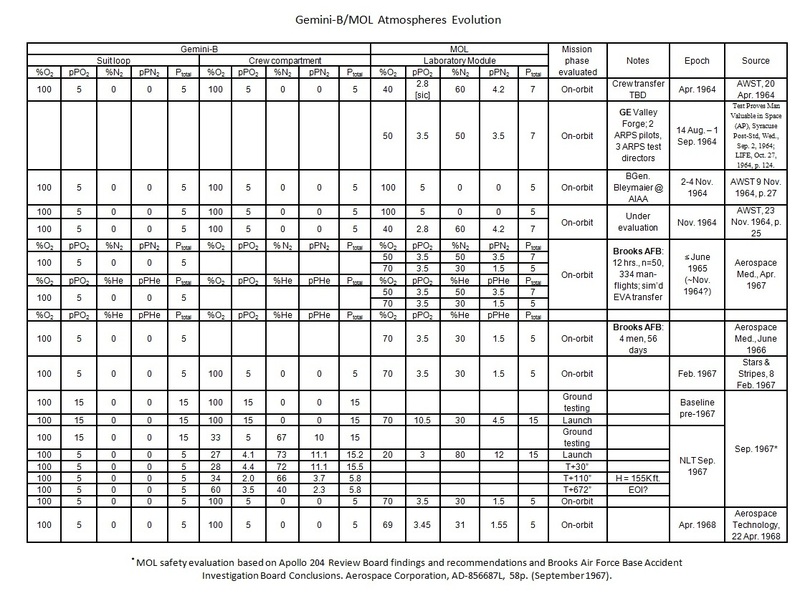 ), Biomedical Results of Apollo (Washington, D.C.: NASA, 1975), http://history.nasa.gov/SP-368/sp368.htm (accessed 4 Nov. 2012). 11. Robertson, W.G., J.J. Hargreaves, J.E. Herlocher and B.E. Welch, “Physiologic Response to Increased Oxygen Partial Pressure II. Respiratory Studies,” Aerospace Medicine, 35(7): 618-622, July 1964. 12. Thomas, K.S., and H.J. McMann, US Spacesuits (Chichester, UK: Springer-Praxis, 2006), “Chapter 8: U.S. Air Force spacesuits,” pp. 179-193; see also the discussion of the Integrated EVA (IEVA) suit from Hamilton Standard contracted by the U.S. Air Force in 1967, in Harris, G.L., The Origins and Technology of the Advanced Extravehicular Space Suit (San Diego: Univelt, Inc., 2001), “Chapter 4: The Apollo Application Program Era,” pp. 201-2.